The most recent trends report available from the National Cancer Registry is on childhood cancer. The detailed report describes data on incidence rates and incidence trends over time, treatment, survival and mortality for cancers among Irish children (age 0-14 years). On average, 128 cancers were diagnosed per year during 1994-2011 with incidence rates being being significantly higher (by 14%) in boys than in girls. Leukaemias (n=40 per year) were the most frequently diagnosed cancers, followed by brain and central nervous system tumours (n=33 per year) and lymphomas (n=13 per year). 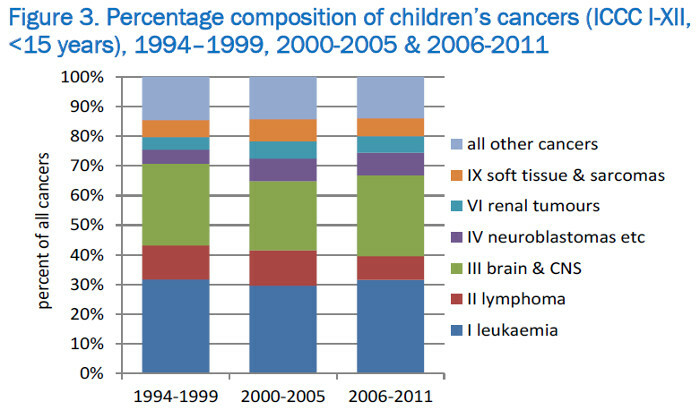 Overall, there was a slow but non-significant increase for childhood cancers over time. Treatment varied substantially by cancer type, but chemotherapy was the most frequent mode of treatment overall. 5-year survival was approximately 80% throughout 1994-2011. More substantial improvements in survival are evident from longer-term mortality trends, with recent mortality rates about 60-70% lower than in the 1950s and 1960s. Overall incidence rates and survival for childhood cancer in Ireland are close to the European average in recent years, and mortality rates are among the lowest in Europe.